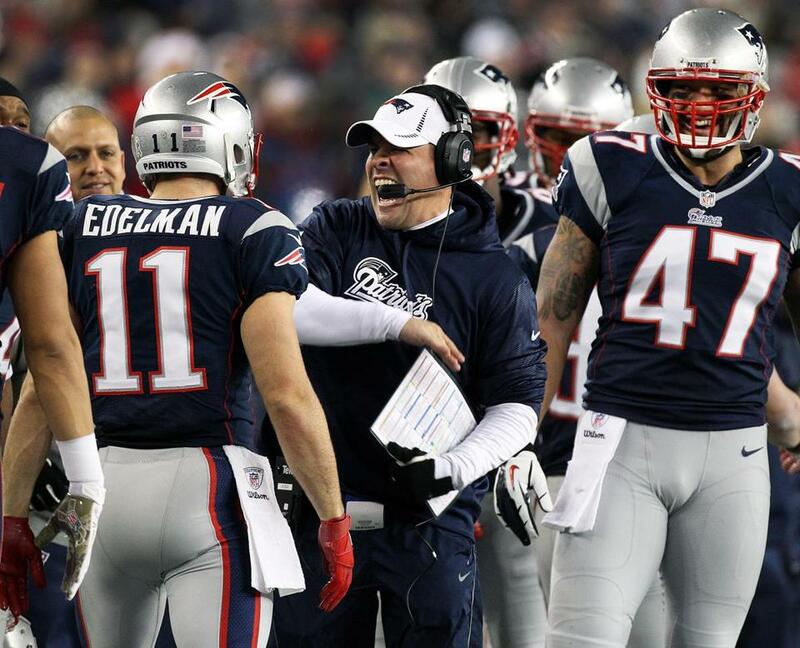 Offensive coordinator Josh McDaniels was thrilled about Julian Edelman’s score. FOXBOROUGH — Most of his teammates had already showered, dressed, and left the locker room following Sunday’s 59-24 pasting of the Indianapolis Colts. But Julian Edelman was still in his uniform, fingers still taped, eye black streaking down his face. Some days, it seems, you don’t want to see end. Edelman had one on Sunday, racking up a career-best 222 all-purpose yards in his finest day as a Patriot. He scored two touchdowns, becoming the first Patriot since Irving Fryar in 1985 to score on a reception and a punt return in the same game. Fryar also did it against the Colts, as did Stanley Morgan in 1979. It’s now a three-man club, with the Colts once again the victim. Edelman nearly added a third touchdown a third way, taking a reverse handoff in the fourth quarter and rushing 47 yards to the Colts’ 3. Edelman didn’t score — he bumped into teammate Michael Hoomanawanui at about the 15-yard line, contact that might have kept him from reaching the end zone — but the run was the longest of his career, and a season-long for the Patriots. It’s hard to find a turning point in a 35-point blowout, but the Patriots were struggling early in the game, trailing after the first quarter for the first time in a month and in need of some kind of emotional boost. Edelman provided one with his punt return, which came early in the second quarter. He fielded a Pat McAfee punt at the Patriots’ 32, followed some blockers, and raced up the right sideline, blowing past his bench for a 68-yard touchdown, which helped tie the game at 14. It was Edelman’s third career punt return for a touchdown, which ties the franchise mark shared by Troy Brown and Fryar. Two plays later, Colts quarterback Andrew Luck had a pass intercepted by Aqib Talib, who returned it 59 yards for another touchdown, putting the Patriots in front to stay. Two touchdowns in a 61-second span, without the offense taking the field, turning a 7-point deficit into a 7-point lead. It started with the punt return. Edelman’s second touchdown of the game came on the opening drive of the third quarter, his 2-yard pass from Tom Brady capping a 10-play, 76-yard drive. It was part of Edelman’s best receiving day of the season, too. He caught five passes (he was targeted seven times) for 58 yards. His only touchdown coming into the game was a short reception against Baltimore in Week 3, when Edelman hurt his hand, an injury that cost him three games. Healthy again, Edelman is making an impact. In addition to the 68-yard score, Edelman returned one other punt, and took that one back 49 yards in the fourth quarter, which led to the Patriots’ final touchdown. Running, catching, returning. Edelman, at least on this night, did it all. The only thing that didn’t go his way was not scoring on the end-around. The locker room had started to clear after the game, but Edelman was still sitting in front of his locker stall, a smile on his face, a phone handed to him for a quick radio interview. He wouldn’t have much time to enjoy it. The Patriots have a short week, scheduled for a Thanksgiving night game against the Jets. Or, as Edelman viewed it, another opportunity.